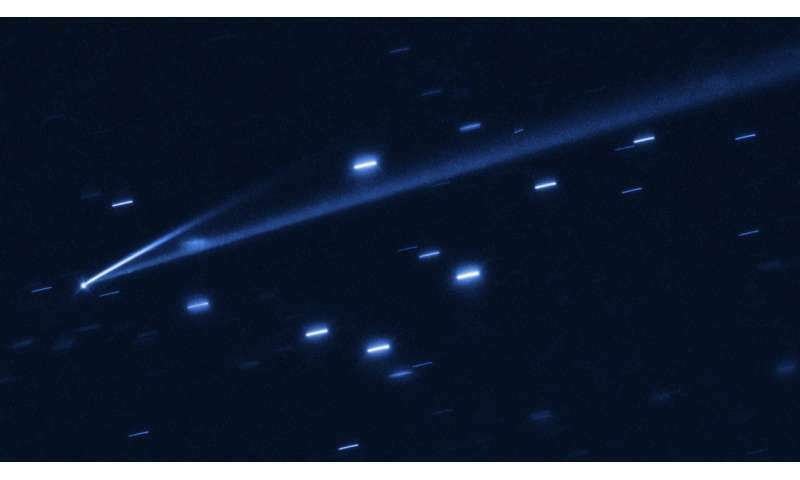 Images from Hubble show two narrow, comet-like tails of dusty debris streaming from the asteroid (6478) Gault. Each tail represents an episode in which the asteroid gently shed its material—key evidence that Gault is beginning to come apart. "We didn't have to go to Gault," explained Olivier Hainaut of the European Southern Observatory in Germany, a member of the Gault observing team. "We just had to look at the image of the streamers, and we can see all of the dust grains well-sorted by size. All the large grains (about the size of sand particles) are close to the object and the smallest grains (about the size of flour grains) are the farthest away because they are being pushed fastest by pressure from sunlight." Gault is only the second asteroid whose disintegration has been strongly linked to a process known as a YORP effect. (YORP stands for "Yarkovsky-O'Keefe-Radzievskii-Paddack," the names of four scientists who contributed to the concept.) When sunlight heats an asteroid, infrared radiation escaping from its warmed surface carries off angular momentum as well as heat. This process creates a tiny torque that can cause the asteroid to continually spin faster. When the resulting centrifugal force starts to overcome gravity, the asteroid's surface becomes unstable, and landslides may send dust and rubble drifting into space at a couple miles per hour, or the speed of a strolling human. The researchers estimate that Gault could have been slowly spinning up for more than 100 million years. Piecing together Gault's recent activity is an astronomical forensics investigation involving telescopes and astronomers around the world. All-sky surveys, ground-based telescopes, and space-based facilities like the Hubble Space Telescope pooled their efforts to make this discovery possible. 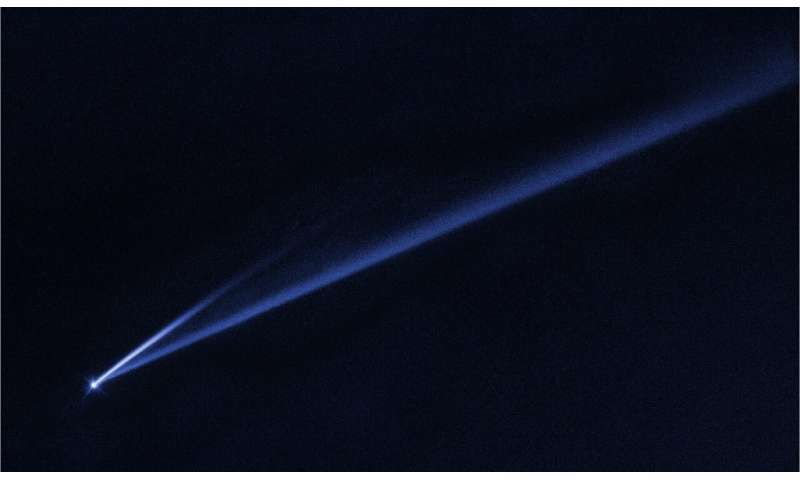 The initial clue was the fortuitous detection of the first debris tail, observed on Jan. 5, 2019, by the NASA-funded Asteroid Terrestrial-Impact Last Alert System (ATLAS) telescope in Hawaii. The tail also turned up in archival data from December 2018 from ATLAS and the Panoramic Survey Telescope and Rapid Response System (Pan-STARRS) telescopes in Hawaii. In mid-January, a second shorter tail was spied by the Canada-France-Hawaii Telescope in Hawaii and the Isaac Newton Telescope in Spain, as well as by other observers. An analysis of both tails suggests the two dust events occurred around Oct. 28 and Dec. 30, 2018. Follow-up observations with the William Herschel Telescope and ESA's (European Space Agency) Optical Ground Station in La Palma and Tenerife, Spain, and the Himalayan Chandra Telescope in India measured a two-hour rotation period for the object, close to the critical speed at which a loose "rubble-pile" asteroid begins to break up. "Gault is the best 'smoking gun' example of a fast rotator right at the two-hour limit," said team member Jan Kleyna of the University of Hawaii in Honolulu. An analysis of the asteroid's surrounding environment by Hubble revealed no signs of more widely distributed debris, which rules out the possibility of a collision with another asteroid causing the outbursts. The asteroid's narrow streamers suggest that the dust was released in short bursts, lasting anywhere from a few hours to a few days. These sudden events puffed away enough debris to make a "dirt ball" approximately 500 feet (150 meters) across if compacted together. The tails will begin fading away in a few months as the dust disperses into interplanetary space. Based on observations by the Canada-France-Hawaii Telescope, the astronomers estimate that the longer tail stretches over half a million miles (800,000 kilometers) and is roughly 3,000 miles (4,800 kilometers) wide. The shorter tail is about a quarter as long. Only a couple of dozen active asteroids have been found so far. Astronomers may now have the capability to detect many more of them because of the enhanced survey capabilities of observatories such as Pan-STARRS and ATLAS, which scan the entire sky. "Asteroids such as Gault cannot escape detection anymore," Hainaut said. "That means that all these asteroids that start misbehaving get caught." That this is occurring without a collision, is important to learn about. An unpredictable if infrequent danger for both Manned & Unmanned craft to approach. The data about this rubble pile is that it seems to be dry. that most of the rocks & pebbles seem to maintain cohesion for now. Even as the structural integrity is being stressed. That data mat be useful if a rubble pile was spotted heading for the Earth, long enough out to be intercepted or diverted. If intercepted far enough out? Small charges might be sufficient to break it up that when it all hits the Earth's atmosphere? The loose, spreading cloud of gravel would mostly burn up at an altitude to avoid any major damage on the surface. As for diversion, I had believed these cosmic junkyards would need to be netted to safely shift it's orbit. Maybe not? The reason I mentioned dry? I would expect pockets of ices & gases could prove explosive if the stony material enclosing those volatiles were heated.